Wind shear and gradient are universally existing natural phenomena caused in part by the earth’s boundary layer. They are differences in wind speed and direction that change with altitude. We define wind shear as a change in wind direction with altitude, and wind gradient as a change in wind speed with altitude. Shear and gradient are ALWAYS present, but not always to a noticeable extent. In the spring (during calibration season), with warm air over cold water, the effects can become quite pronounced. If you don’t believe in wind shear, the next time you’re out tacking upwind on a nice sunny calm spring day, take a look at the windex on each tack and you’ll see what we’re talking about. You can also deploy the ‘ShearOmometer’. Wind shear changes wind angle (both apparent and true) but it does not invalidate the wind direction solution. Because the top of the mast is pointed in the same direction and going the same speed as the hull, the solution remains valid.. However, wind shear prevents tack-to-tack comparison of wind angle and boatspeed. The photo on the right is of a 64’ boat on the east cost with well-calibrated instruments. Note that heading and wind direction are both 288º (i.e. zero true wind angle), and yet the boat is trucking along at over 9 knots! The jib is trimmed on port, but the top is plastered against the mast. Not a good day to calibrate. 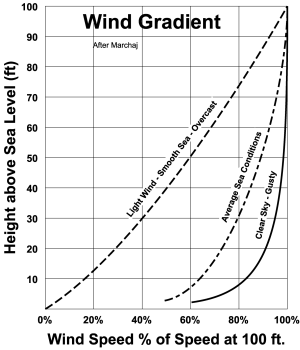 There are a lot of non-believers out there, who, once they get it; realize that knowing when the instruments tell them that wind shear and gradient are present, use the information to help them control the boat better. Wind shear has a major effect on boat performance; a few degrees can cause considerable change in performance tack to tack. When the wind is twisted, the sails have to be trimmed differently on each tack in order to get the best performance. Boatspeed, heel angle and helm feel will also be different. Unless the underlying cause is understood and factored into the way the boat is handled, the crew can become frustrated. For the “fat” tack (wind twisted to weather), sail tops must be let out and jib cars moved aft. Boatspeed will be above target. On the “skinny” tack, the opposite holds true. For high gradient situations, you will not be able to meet your target speed. Once you have determined your new target, you should factor it in when going onto the new tack. Wind gradient (change in wind speed with altitude) is more subtle. It generally manifests itself as the inability to meet your target speed, sometimes dubbed “popcorn wind”. Instruments provide the means for discovering and quantifying wind shear and gradient. The amount of shear can be determined by comparing true wind angle (not wind direction) tack to tack. Shear indicates wind direction aloft that will eventually mix down to the main part of your sailplan. This means that it predicts the future wind direction. Knowing the shear gives a clue about which way to go to be on the favored side of the fleet when the new wind arrives. Here’s how to find out how much shear you have. Adjust out wind shear or not? Many instrument systems have a means to “adjust” out shear (Ockam included). 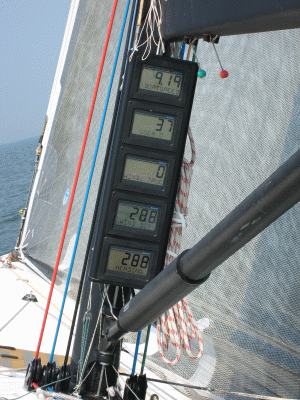 Many sailors think they should use this adjustment to force wind angle to be the same on both tacks. However, this masks a valuable piece of information that can be used to improve performance. 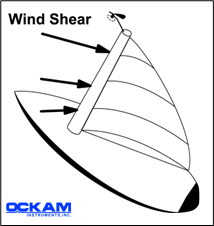 Instead, the shear should be determined and used to guide the proper sail trim and helmsmanship. When you know boatspeed will be low and by how much, and that the helm will feel dead, and that the car should be placed there, bliss will return, and performance improves. The WTP apparent wind display is actually back-calculated from their true wind solution. They do this because they want the adjustments applied to the true wind solution to “fix up” the apparent wind. In this process, any wind shear and gradient information is obliterated. The sails see the apparent wind that the masthead sensor sees; retro-apparent is a fiction that prevents you from knowing what the sails actually see.